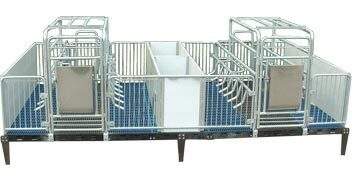 Designed for two sows , providing the comfortable environment for the sows delivery and nursing. ��Complete hot-dipped galvanized steel provide excellent durability. ��Efficiently keep the piglets away from the sow to reduce crushing death. ��Provide different floors for sow and piglets respectively. Cast iron floor provide a cool and comfortable for the sow while the plastic floor provide a warm, less abrasive area for the piglets. ��Fiberglass thermal container could control the temperature and protect the piglets in cold winter.